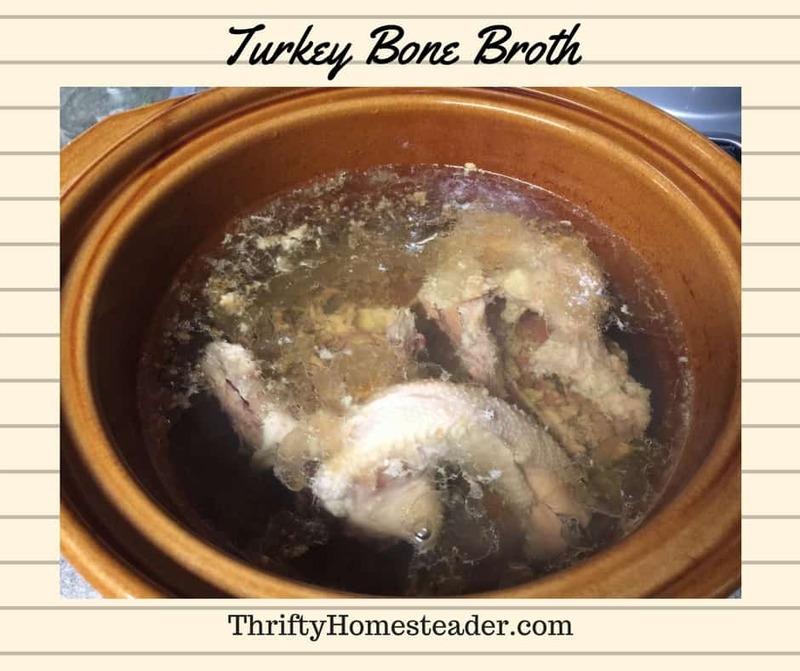 Have you ever made turkey bone broth? Like many Americans, after cutting all the meat off our Thanksgiving turkey, we used to throw the bones in the trash. It breaks my heart now thinking of all the lost cups of bone broth that we didn’t have through the years. However, as the saying goes, you’re smart if you learn from your mistakes, but you’re wise if you learn from someone else’s. You can learn from my mistake and make a pot of turkey bone broth after Thanksgiving this year. In addition to being delicious, bone broth is also healthy. It contains collagen, glutamine, calcium, and other minerals. Making bone broth is one of the simplest things you can do in the kitchen. Simply put the bones in a pot, cover with water, and cook over low heat for 24 hours. I prefer to use my slow cooker, but you could do this on your stove. You can sprinkle a teaspoon of salt into the water, and you can also add a chopped onion, a couple of sliced celery stalks, and a few sliced carrots, if you want. Sometimes I do. Sometimes I don’t. It’s all about variety for me. If I’m in a rush, I might add a teaspoon of garlic or onion powder instead of chopping up vegetables. A cup of warm bone broth is a delicious and healthy way to start your day. Might sound weird, but once you’ve done it, it may quickly become a part of your morning ritual. It warms you up like a cup of coffee or tea, and it’s nutritious. Back when I was a coffee drinker, I liked to mix it up and buy different types of coffee. I have about two dozen different types of tea in my cupboard. And I like to drink different types of bone broth in the morning — turkey, duck, chicken, and beef. You can also use bone broth as a natural flavoring. Cook rice or quinoa in bone broth instead of plain water. Cooking lentils in bone broth takes them to a whole new level of deliciousness. In fact, if you don’t like lentils cooked in water, you should try them cooked in bone broth. To make gravy with bone broth, spoon off the fat that rises to the top. Put it in a saucepan and add an equal amount of wheat, oat, or rice flour. Heat over medium-high heat and whisk until all lumps are dissolved. Then add 1/4 cup of broth for every 2 tablespoons of fat that you used. If you don’t think you’ll use all of your broth within a week, you can freeze it in glass canning jars that are labeled freezer-safe. Ah! I just got a bit “sick” when I realized that I have removing the fat after the broth cools and giving it to the hens who surely love it. However, I didn’t ever think about using it for gravy. Some times the obvious goes right by us!